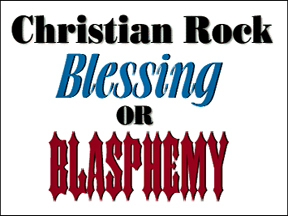 "There is no such thing as 'Christian' rock!" She is sitting forward in her chair, glaring in self-righteous anger at me. Her boyfriend, who had been friendly to me until just now, was suddenly silent and watching me through narrowed eyes. All I had done was answer her question "what kind of band do you play in", and suddenly I was faced with the fundamentalist version of Linda Blair in The Exorcist. I was almost expecting her head to spin around. Somewhat taken aback, as their other friends began circling like sharks anticipating a feeding frenzy, I tried reasoning with them. "Is God the Creator of everything?" "Can the devil create anything?" Vehement disagreement. So far, so good. "So, is God the Creator of music and the ability to play, write and enjoy music?" Absolutely, they affirmed, heads nodding. "Did St. Paul really say 'becoming all things to all people', and is that a reasonable approach for us for follow?" Of course, they shrug impatiently. "So, if the devil can't create anything (including musical styles), and God is the Creator of all (including music and our ability to write, perform & appreciate it), and St. Paul's example of 'becoming all things to all people' is one we should follow -- does it make sense that we can use rock music to reach people for the sake of Jesus?" Absolutely, no question, whatever it takes to spread the Word. "So, then it's okay to use Christian rock, after all." She stiffens and bolts forward in her chair once more, eyes narrowing and expression contorting. Her boyfriend, and their shark-circle of friends, who had begun to relax during our dialogue, suddenly look all tense and judgmental once more. "There is no such thing as 'Christian' rock!!" she snarls, as her friends nod vigorously and triumphantly, as if they've just proven something. Wow. Pavlov would've loved this pre-programmed reaction to the catch-phrase 'Christian rock'. I can't be entirely certain, but I'm reasonably sure I heard the sound of a lynch mob forming, possibly ready to burn a heretic at the stake. (B) will I get out of here alive? I still don't know the answer to the first question, but the fact that I'm writing this -- 22 years later -- is proof of the answer to the second.